RW: In the ebbs and flows of what is trendy, the big muzzleloading boom of the late 1980s and 1990s has long since diminished. It is a shame, though, for muzzleloading has never been easier or more effective than it is today. Many states, particularly east of the Mississippi have long allowed muzzleloaders not only in dedicated muzzleloading seasons, but alongside their firearms seasons which often do not allow center-file rifles at all, but just shotguns. Compared to a slug gun, you have essentially twice the range, less recoil, greater accuracy, and less cost per shot. It is mind-boggling that muzzleloading is often so sorely over looked, when it is often the best equipment for the quick, clean harvesting of game. Bob, what's your view on this? RW: By better muzzleloading components, I'm referring to sabots from MMP that are significantly stronger than a decade ago, propellants far more consistent and less corrosive (Blackhorn 209), and dedicated muzzleloading rifle bullets rather than just shoving cannelured pistol bullets down the bore and hoping for the best. Lots of people want the best load, whatever works best in their individual rifle would be the best, but they often want specifics-- specifics that the rifle manufacturers don't or won't provide. So, let's go down the line by brand and see what your experience has shown. Let's start with Thompson .50 caliber inlines, generally 1:28 rate of twist and generally with tight bores. I want to shoot a whitetail, what do you suggest? An elk or a bear? 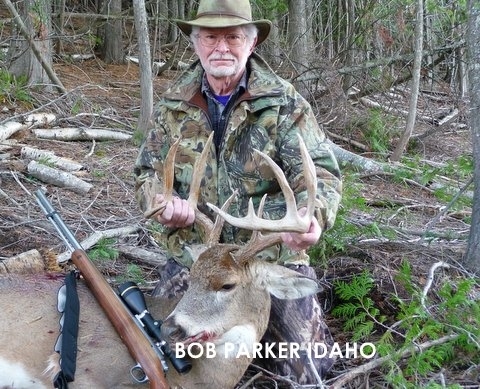 Bob Parker: The Thompson .50 caliber inline is a very fine performer with the present day projectile-sabot-powder combination. My particular T.C. happens to be a Pro-Hunter and it performs flawlessly with saboted projectiles. When I am hunting whitetail deer with the Pro-Hunter the bullet of choice is the 275 gr. Ballistic Extreme. 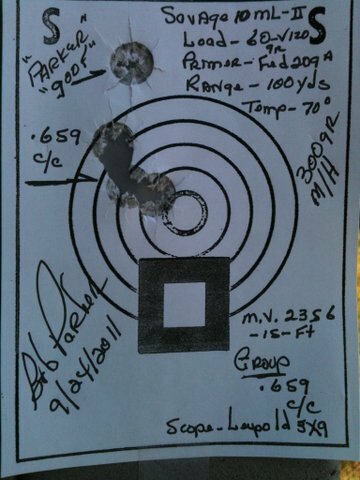 It gives a 1 100 yd group on a regular basis and is flatter shooting than the 250 gr., if you are shooting in the 200 yds range. The terminal effect of the 275 gr. is also (for me) desirable; it will expand readily and 95% of the time give complete pass through. Couple this with 110-120 gr. of Blackhorn 209 and you have a hard to beat combination. This is not to say the 250 gr. bullet is not a good performer, it is. Accuracy wise it won the NMLRA/NRA Championship in 2008, 2009, 2010 and 2011. 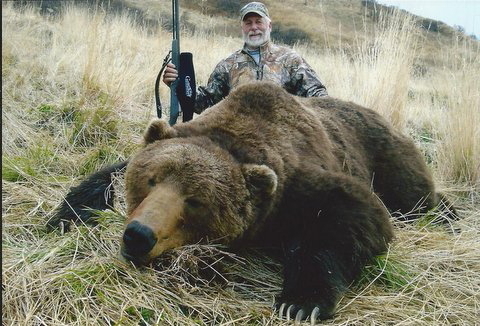 In regards to elk and bear: For bear, I would use the 300 gr. Hydra Con and if we are talking large bear the 300 gr. Match/Hunter. If the purpose is to break the animal down, the ticker jackets of the Match/Hunter is desirable. I believe the 300 gr. bullet, to be the best choice. For standard stand over bait hunts the 300 gr. Hydra Con will give great expansion, good penetration although complete pass through may or may not be a reality, as you know, the elasticity of a bears skin takes a lot of punch to penetrate on exit. In considering this, I might add for those who draw a Western States Elk Tag and are required to use a lead bore size projectile we do have a 475 gr. Bore Size Hydra Con that shoots well in the T.C. 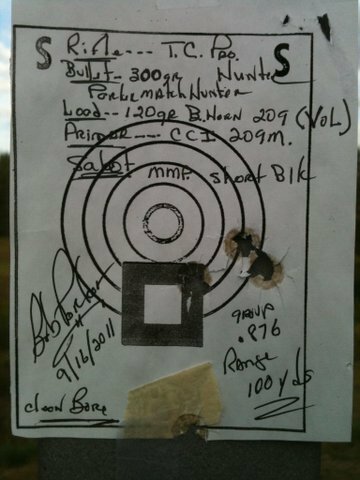 It will not perform like a sabot bullet, but accuracy in my Pro-Hunter was 1 ½ - 2 @ 100 yds. Needless to say the 475 gr. has power to spare for any game you might encounter. 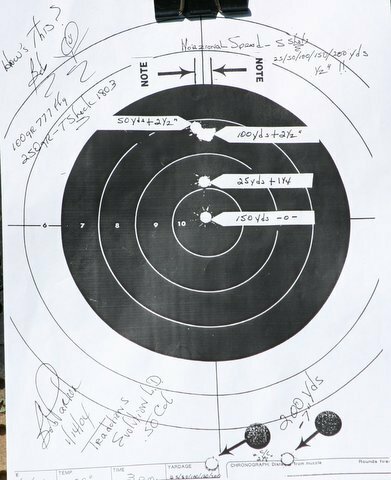 This projectile shoots surprising flat for its weight and terminal potential -0-@25 yds +3 @ 50yds +4@100 yds; -0-@150 yds and -18@200yds. The hydraulic gives good expansion and penetration at the above ranges. Bob Parker: What has been said regarding bullet choice in the T.C. applies to the Knight and Green Mountain as well. There are a couple of observations I would make concerning the Knight. In my experience with the One Bolt Recoil Rifles a 150 gr. load did not shoot well. When the powder charge is in the 100-130 grs (pydx or 777) accuracy was very good, above that the groups opened up. 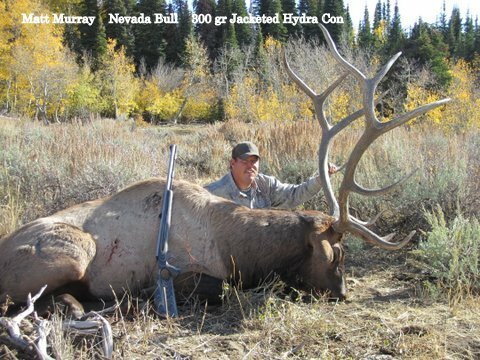 Blackhorn 209 (100-110 grs. vol.) in the rifles I shoot proved extremely satisfactory. With any weapon to find the best load, personal testing is required. The second observation is in relationship to the conical; as you stated the Knight is fine conical rifle, which makes it for me the weapon of choice for Western States that have the all lead, no more than twice bore diameter in length restrictions. Almost 15 years ago we developed a line of conical for the Knight that complies with all western states regulations and shoots very well. Needless to say the Hydra Con (Hydraulic Conical) is very effective on all US game. These bullets come in 45, 50, 52 and 54 calibers and are especially suitable for the Knight. The Knight Rifle is generally well made, user friendly and rugged enough for hard conditions. In regards to the Traditions, I have much personal experience. This experience does not cover the last few years, it ends the year the Pursuit was the new offering. We produced bullets for Traditions for several years; therefore, I tested each new model. The rifle is inexpensively made, but it will shoot! It shoots conical as well as sabots very well. In fact the best string of testing shots I have ever fired was with a Traditions Lightning Bolt. The string was one shot at 25, 50,100,150 and 200 yds. Testing for drop; the thing impressive was the horizontal spread- it measured ½ of 1 (target included if you wish to display it). The Traditions is a bit rough, often more laborious to disassemble and clean, but properly cared for all I tested shot very well with no failures. Bob Parker: Concerning the Hawken/Flintlock/Percussion rifles, let me simply say we have Western States legal bullets in 45-58 cal. I have both percussion and flinters; I would be pleased to chat with anyone that is working with what some call oldin my view historically proven weaponry. We also have the Hydra Con available for the Sharps. We can give a selection of alloy mix as well as bullet design, this is a sleeping passion for me; because of time usually all I do is dream about this area, but availability exists. Bob Parker: From my perspective, jacket thickness is a very important area and should be considered carefully, especially in a muzzle loading weapon. To begin with it is my opinion that one bullet will not always meet all needs. If hunting non-dangerous thin skin game, I prefer a light jacket quick opening projectile. I want the bullet to penetrate the rib cage, release its energy and exit. Sometimes that is a tall order, you can always get one or the other, but both quick expansion and exit sometimes do not go together. 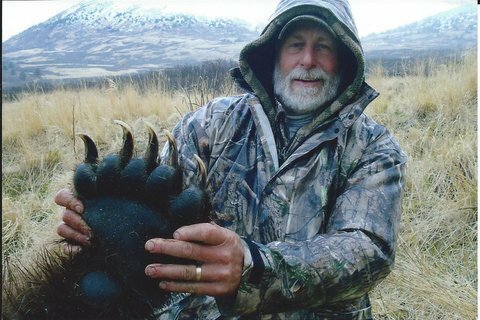 Above, a happy Duane Dunham with his one shot kill Alaskan Brown bear: 28-1/4 inch skull, squared right at ten feet. The one shot was with a Parker Match Hunter 300 grain bullet at about 100 yards. A real monster, this looks to be #2 in the SCI all-time muzzleloading record book. Via B & C, the bear is 28-3/16 in. which may well be the #1 NMLRA Longhunter record animal. If a persons preference is a point of shoulder or high shoulder shot a thicker jacket is desirable. In order to break bone and maintain its structural integrity the projectile has to be tough. The thin jacket bullet may very well kill in this circumstance, but for me when shooting where I know I will hit bone more jacket thickness is desirable. When you move to the dangerous thick skinned game, you need a thicker jacket for sure. Regardless of bullet construction, shot placement will always remain the primary consideration. If poorly placed no matter the projectile being used a clean humane kill is very unlikely. Bob Parker: I have used the Spin Jag for over 10 years. It is a very well made tool, sturdy in construction, practical in application. It loads the projectiles straight, simplifies cleaning, spins with the projectile as it loads avoiding stripping. The bullet starters are fantastic and I use them with all our bullets. I have found the product to be a very valuable tool. Over my shooting bench is a well stocked rack with various calibers of loading and cleaning equipment; no matter the rod or tool, they have one thing in common, all are equipted with a Spin Jag. Bob Parker: The development of our bullet line is based on three key things, accuracy, flight performance and terminal energy transfer. This is what first brought us to develop and patent the Hydraulic Expansion System found in our Hydra Con line of projectiles. When these bullets were developed high velocity muzzleloading was not yet a consideration; to get a bullet to expand and transfer its energy was. Therefore, we developed a hunting bullet that would do just that. When the high velocity weapons began to appear our bullets especially the 275 Ballistic Extreme were used with good success, but in some cases it was explosive performance vs. controlled expansion. As the weapons and propellants became capable of more and more velocity the need for a bullet equal to the rifles capability was called for. It needed to have a higher B.C. a thicker jacket, be deadly accurate, able to deliver acceptable terminal performance both near and far. Thus the Parker Match/Hunter, its creation was driven by practical necessity. It has proven to be a very worthwhile investment of time and resources.